Sectarian singing heard during Rangers' match against Hibernian at Ibrox is to be discussed by the Scottish Professional Football League board. Chanting from sections of the home support made up part of the league delegate's report from the Scottish Championship game on 28 December. And the matter will be discussed at a meeting on 19 January. However, the BBC understands it is unlikely that action will be taken because of current league rules. Sectarian singing has featured in a number of domestic delegate reports in recent years. However, Rangers provided the league with evidence that they were doing everything in their power to prevent such behaviour. Rangers have also been fined by European governing body Uefa relating to offensive chanting in European matches. It has led to calls for a rule change within the Scottish game in a bid to tackle the problem. Following the match against Hibs, which Rangers won 4-2, the Glasgow club issued a website statement condemning fans who took part in what they described as "inappropriate singing". 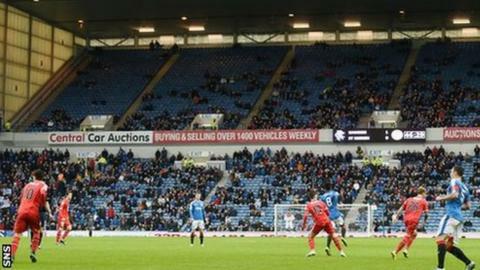 Rangers stressed it was a minority of fans involved and said would assist Police Scotland in identifying the culprits. Police Scotland says its enquiries are ongoing, saying: "As is the case with all matches, footage and other evidence will be reviewed and action taken if and when appropriate." A Scottish Government spokesperson said: "We remain committed to tackling all forms of prejudice and discrimination in Scottish society and have invested £11.5 million over the last four years to fund projects aimed at tackling sectarianism wherever it arises, including projects working with football clubs and fans. "We fully support football governing bodies and clubs in taking forward appropriate action. "However we will not be complacent and will continue to work with the SPFL board as well as Police Scotland and other relevant agencies to stamp out sectarianism and all other types of offensive behaviour associated with Scottish football."